Phanom Rung is also known as Prasat Hin Phanom Rung. This Khmer style Hindu temple is in the Buriam province 50 kilometres north of the border with Cambodia. Once this temple complex was part of the Angkor Empire. Even today many locals speak a dialect of the Khmer (Cambodian) language. The temple complex is situated on the rim of an extinct volcano at 402 metres above sea level. To reach this temple complex you have to climb a huge stone stairway. This results in a quite scenic setting with views of the countryside all around. The temples can be reached from the 27 kilometres away town Nang Rong. More travel and background information. Information and directions on www.tourismthailand.org. 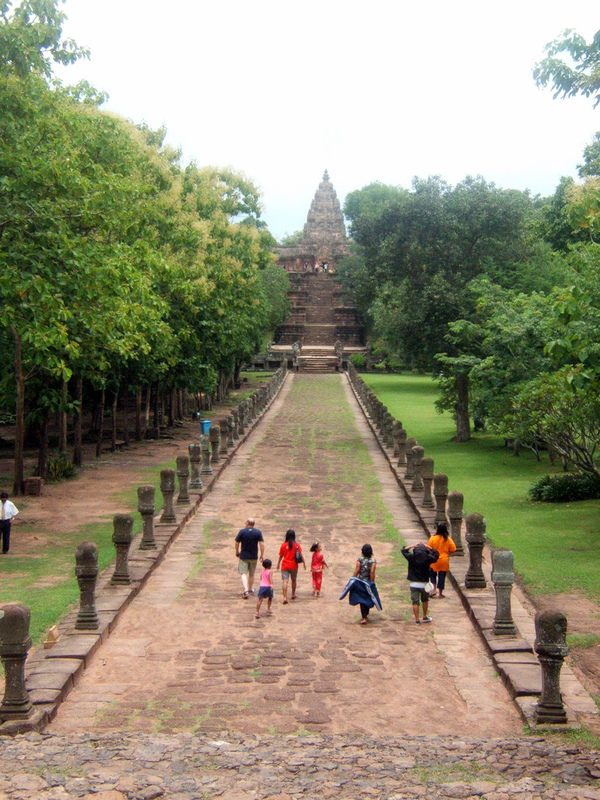 Visitors entering Phanom Rung historical park. Source:Flickr, Tim Parkinson.